The item Fire spook, Monica Graham represents a specific, individual, material embodiment of a distinct intellectual or artistic creation found in Evansville Vanderburgh Public Library. Just below the Antigonish-Guysborough County line, there is an overgrown spot, nearly impossible to find without a guide, where the cursed MacDonald farm once stood. Though no physical trace remains, the legend of the mysterious events that once took place lives on. 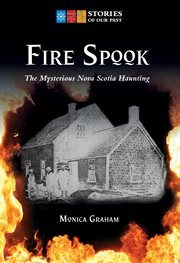 In the newest addition to the Stories of our Past series, Monica Graham exposes the fascinating history behind the fire-spook of Caledonia Mills, Nova Scotia, and a true story that spread as quickly and uncontrollably as the flames that started it all. But were these spontaneous fires and sinister sightings the work of a poltergeist, or of a troubled young woman?